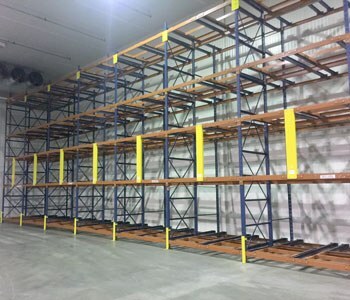 Make it easy to load pallets onto a rack system with a push back pallet rack system that uses carts and railing to make it easy to fill up your warehouse space. These last-in-first-out (LIFO) systems can also be configured to a first-in-first-out (FIFO) arrangement for added flexibility. 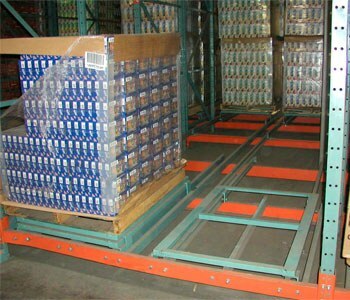 To load, lift drivers add a pallet in the front of the system on a rail cart. As more pallets are added to the system, the last pallet is pushed one space farther into the system. A gravity system makes unloading an easy task with gravity feeders that push the next pallet in line towards the loading/unloading space. Lift truck drivers always have a pallet ready for transfer in the first rack position in a push back pallet rack. Is a Push Back Pallet Rack Right for My Warehouse? When you choose to install a push back pallet rack system, your average storage capacity will increase anywhere from 25-65%. This solution is perfect for warehouses that store different product types in one area. For warehouses that deal with products that have a long shelf life and high inventory turnover rates, this system increases efficiency and productivity by optimizing the loading and unloading process. Q. Why should I select pushback rack? 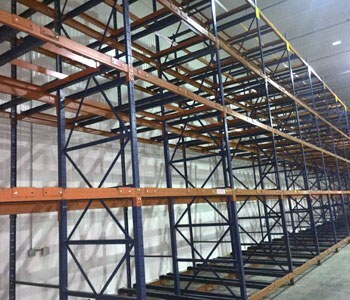 A. Pushback racking is a high density storage system with last in, first out (LIFO) configuration. Compared to drive-in rack, pushback has more flexibility because you can access pallets on different levels without having to clear the entire bay. 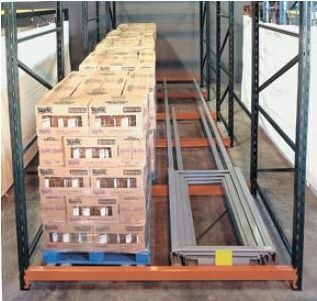 Pushback is an excellent idea for companies that need to store many pallets with many inventory SKU's. Q. What are the benefits of pushback racking? A. One of the major benefits of pushback is that you can substantially increase your storage capacity because the system requires fewer aisles than standard pallet rack. 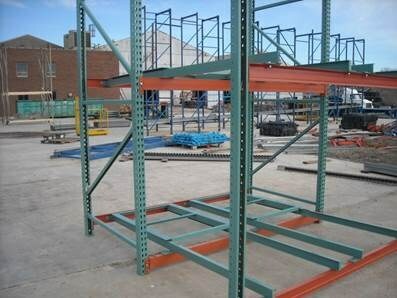 Pushback rack allows a higher level of access to retrieve pallets from a specific location than most storage systems. 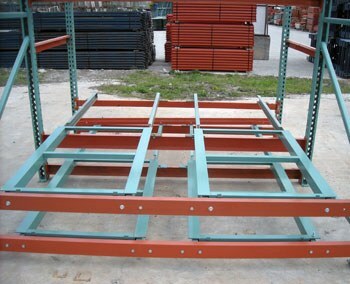 This system is fairly low maintenance and because forklifts do not enter the rack, damage is less likely. Q. What application is best for pushback rack? A. Pushback racking can be used for just about any application where you have multiple pallets of the same product and the quantities could be as low as 3 pallets per SKU. Since each beam level can be accessed of a bay, you are able to store many SKU’s and pick faces in this system. Q. Is used pushback rack available? A. Yes, we generally have several configurations of used in stock but it comes and goes rather quickly. If you need a specific color to match your facility, we can supply you with new material or customize here in our in-house paint shop.